This is a great pen! It's has a beefier rounded body (nearly 1/2" in diameter). Hexagonial shaped finial houses the click mechanism and stiff, elegantly plain clip. The nib has "O" rings to help grip and cushion the pen while writing. For those busy, on the go, individuals who like the convienant of a click pen will cherish this as a gift. 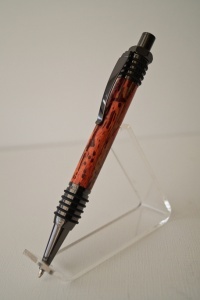 The pen comes dressed in a dyed piece of spalted hackberry (Red). The black accents of the spalting play nicely off the black chrome hardware. It accepts a parker style refill.